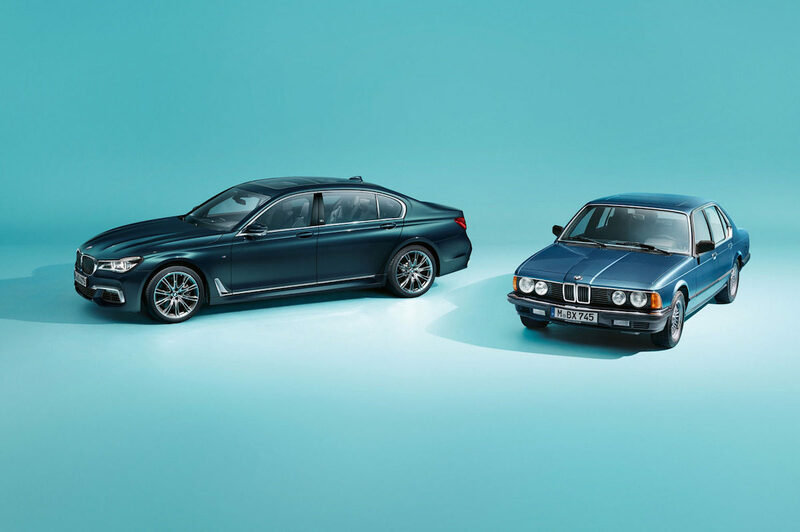 The 7 Series has beaten a path of automotive progress over the last four decades. With its latest iteration, BMW has entered new motoring frontiers yet again – the most exciting, in fact, to date. The 2017 BMW 7 Series Edition 40 Jahre alongside the original 1977 E23 7 Series. The Godfather of Evolution’s philosophically seismic treaties focussed on the biological entities that first crawled from the primordial soup some three-and-a-half billion years ago. But the basic principles outlined in The Origin of Species apply neatly to the strides made in the most recent phase of an industrial revolution which, all signs suggest, is still in its infancy. And, to track the history of the 7 Series is to observe the last four decades of car evolution with your eyes fixed firmly on the vanguard. From the start, it has laid technological milestones in its wake. The inaugural 7 Series model, the 3.2 litre, turbo 6-cylinder E23, featured several innovations - ABS brakes, system fault driver alerts, complex climate control systems, anti-lock brakes, airbags – that would go on to become standard automotive equipment. And, so seduced were consumers by its svelte appearance, superior handling and technical wizardry, the Dingolfing plant could barely keep up with production. Around 280,000 would be built over its nine-year reign. The taller, longer, highly majestic E32-generation 7 series upped the ante when it came to options, with customers offered two wheelbase versions and a 3.0-litre or 4.0-litre V8 engine, or a 5.0-litre V12. It also beefed up the range’s technological credentials with traction control and electronic stability. A third iteration came out in the mid-90s, and brought with it diesel options and satellite navigation - the first European car to offer it – and quickly became the best selling 7 series to date. Meanwhile a car chase scene in 1997’s Tomorrow Never Dies, in which James Bond (Pierce Brosnan) drives one from the back seat using a hand-held device, cemented its place in cultural folklore. The first 7 Series model of the new millennium saw another huge evolutionary leap. Styled by the legendary Adrian van Hooydonk, aided by vast improvements in body panel curving technology, it made a bold-but-beautiful progression from the linear designs conceived by the likes of Paul Bracq and Wilhelm Hofmeister, and thus bears far more resemblance to brand new BMW sedans of today than what came before it. Pioneering gadgetry included iDrive, active anti-roll bars, 6-speed automatic transmission, a Smart Key and night vision, while the 760i model was the world's first production V12 engine to use direct fuel injection. The fifth generation introduced a hybrid drivetrain, 8-speed automatic transmission and all-wheel drive to the 7 Series, while the sixth, revealed in June 2015 at BMW's headquarters in Munich, was perhaps the biggest game-changer to date. Dubbed “a crystal ball for the future of nearly all things BMW” by TopGear.com editor Vijay Pattni, it is stiffer but 130kg lighter than its predecessor thanks to the carbon fibre and aluminium construction, and consequently markedly zippier: the twin-turbo 4.4-litre beast under the bonnet nails 444bhp, and does 0-62mph in 4.4 seconds, topping out at a sensibly imposed 155mph. Add to that better crash resistance, improved suspension and its ability to park itself, and the vehicle’s release seemed to prove wrong the notion that evolution never reaches a final state. Or so we all thought. Little more than two years after the sixth generation edition of the 7 Series rolled off the forecourts, BMW unveiled the 40th anniversary edition at the Frankfurt Motor Show in September: and, the BMW 7 Series Edition 40 Jahre is by far the line’s most advanced expression of comfort, style, quality and technical innovation yet. Each 40 Jahre – only 200 are available worldwide - will be built to individual customers’ specifications. Standard or long wheelbase options are available, as are six-cylinder, V8, V12, all-wheel drive and plug-in hybrid versions. The two colour schemes, both designed to accentuate the vehicle’s seductive curves and contours, are ‘Frozen Silver Metallic’ and ‘Petrol Mica Metallic’. Merino fine grain leather upholstery comes in either smoke white and Cohiba or smoke white and black, each complemented by white piping, with decorative trim around the cabin coming in black piano lacquer or eucalyptus veneer, depending on your leather colour choice. Other nifty touches include discreet badging on the B pillars and doorsills, and 20-inch alloy wheels in a V-spoke design. This truly imperious offering is more than just a 40th anniversary celebration: it’s a statement of intent. BMW is set to enlarge its luxury portfolio in the coming years, next year’s release of the 8 Series Coupé - a display version of which wowed the motoring aficionados gathered at the Concorso d’Eleganza, on the shores of Lake Como earlier this year - being just the first of a wealth of ultra-premium motoring innovation waiting in the wings.